Hey, the harvesting season in the garden has already begun and the first courgettes (zucchini) are ready to be picked! When I studied in Padova, Italy, my house mate from Bari in Southern Italy used to bring the most delicious pickled vegetables from her trips home. 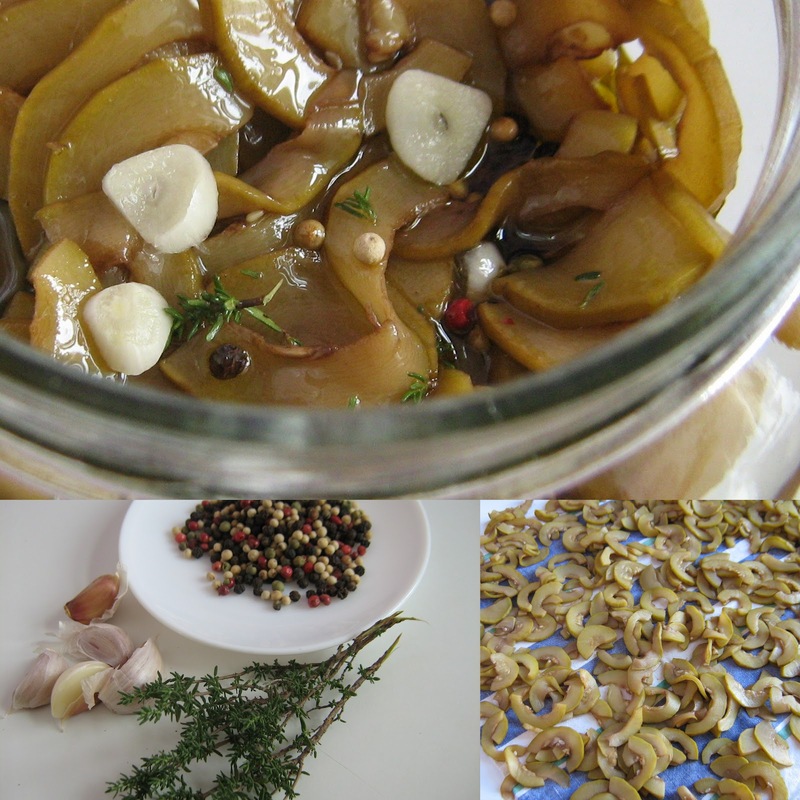 Since then I have been dreaming of the yummy taste of olive oil, herbs, garlic and vinegar. Now that I tried it it turned out to be quite easy and a good alternative to freeze the vegetables when you harvest a lot of them every day. You can even use those that have grown too much and tend to have a rather stiff peel. 1. 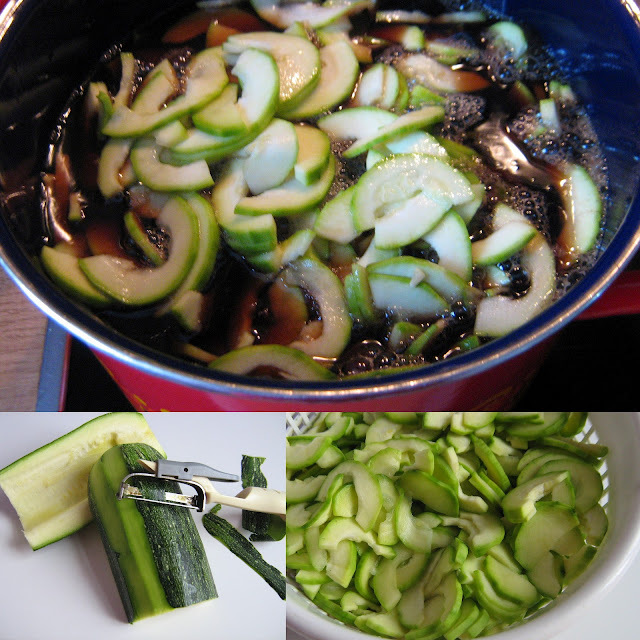 Peel the zucchini and cut them into thin slices. Salt hem abundantly and leave them for 2-3 hrs in a colander. They will loose a lot of water. 2. Mix water and vinegar half and half. You can add bay leaves and some aceto balsamico for taste. When the mixture is boiling, add the zucchini and cook for 2-5 min. They should not be completely cooked. 3. Let the zucchini dry on a towel, then fill layers of zucchini and spices alternately into a sealable jar. Add olive oil until it covers the last layer of zucchini. This is absolutely important, otherwise the vegetables will rot. Leave it for 3 weeks before consumption. The pickled zucchini last several months without any problem. Just make sure they are always covered with oil. Interpreter, language and dancing teacher, researcher in religious studies, Kathak practitioner, yoga student, textile addict, book lover, fashion and jewellery designer, daydreamer, adorer of spices, tea lover and coffee addict, culture crosser between Germany, Italy and Algeria, proud mom of two. Join me for a journey around the Mediterranean Sea and along the Silk Road, collecting inspiring stories, fragrant spices, precious fabrics and traditional music and dancing!